Novastore plastic bins are strong, low cost, suitable for engineering components, medical items, food products, and the home handyman. extremely durable in the market. Polypropylene is impervious to acid and alkaline, oils and most chemicals, and will withstand temperatures up to 125 deg C without distortion, for cleaning. 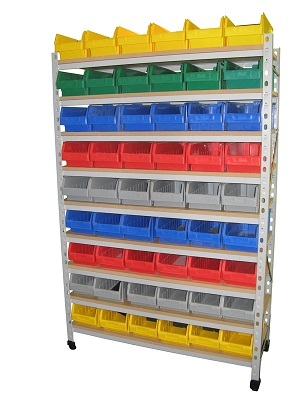 Novastore Supra bins are stocked in 5 colours to assist you with your inventory management. A very extensive selection is available including Mobile, Swivel Carousel, Static and Wall Mounted Novastore Mobile Parts Bins which are arranged in any way you choose.